There are three species of weasels in Minnesota, the short-tailed weasel (Mustela erminea), the long-tailed weasel (Mustela (renata, and the least weasel. All belong to a family of mostly long, narrow "tube-shaped" animals in the family Mustelidae. General description: Weasels are small, elongated predators that are brown in the summer, but that turn white in the winter. The short-tailed and long-tailed weasels have a black-tipped tail, while the least weasel is completely white. During spring and fall, as they change color, weasel fur appears blotchy. Length: The short-tailed weasel measures seven to 14 inches. The long-tailed weasel is slightly larger, about 16 inches, and has a longer tail. Weight: The short-tailed weasel weighs only two to five ounces, while its long-tailed cousin weighs about seven ounces. Color: All species of weasels are brown on top and white-yellow on their undersides in summer, and turn white in winter. A unique reproductive aspect of most members of the weasel family is the process of "delayed implantation". In most other animals, fetal development is a continuous process which begins at the time of conception. Weasels mate in the period from late summer to mid-winter. The embryos resulting from fertilization undergo an initial development of about two weeks. Then, a long dormant period occurs during which the embryos remain free in the uterus. After this delay, the embryo becomes implanted in the uterus and development resumes. The young are born in the spring about a month after the delayed implantation occurs. Ounce for ounce, weasels are fierce predators. They are excellent mousers, and are efficient at raiding mouse nests. Other foods are new-born rabbits, insects, small birds, and carrion. Weasels are deadly, effective hunters. After dispatching their prey, weasels may lap a victim's blood before eating its flesh. As they feed, weasels usually turn back the skin of an animal. By the time they finish their feast, the skin of their prey is inside-out. For their small size, weasels can defend themselves very well, and their brown-in-summer and white-in-winter camouflage helps them to both kill prey, and avoid being prey. 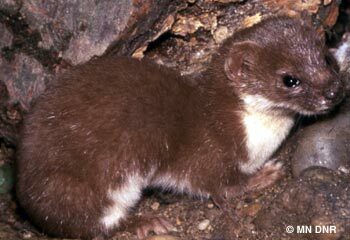 The weasel's main predators are other species of weasels, small hawks and owls, and its bigger cousin, the mink. All three species can be found state-wide, but the least weasel is the least abundant, especially in northeastern Minnesota. Weasels can be found anywhere that their main prey, mice, are found. Typical habitats are grasslands, woodlots, and brush piles. Weasels can also be found in firewood piles and garages. Weasels travel by silent, gliding leaps, the hind feet falling exactly in the tracks of the front ones. They also move under the snow, sometimes for long distances, in pursuit of mice and voles. Weasels are unprotected in Minnesota, and only a few thousand are trapped for their fur in winter. The short-tailed weasel is also called "ermine" and is best known for its fur used for trim on coats. The fur of the least weasel fluoresces (glows) in ultraviolet light. Weasels have voracious appetites, and the least weasel eats about 30 percent of its weight each day. Because weasels have a high surface area to weight ratio, they conserve body heat in winter by curling into a ball and lowering their metabolism.